Enjoy a wonderfully scenic journey through Yorkshire to Hawes, today is Market Day! 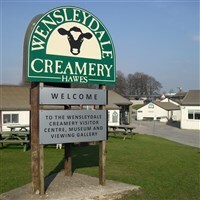 There will be time to explore Hawes Tuesday market before visiting the famous Wensleydale Creamery! Enjoy an included soup and sandwich lunch including tea/coffee before a tour of the creamery with demonstrations and tastings! You will also have time to browse the shop and take home some produce!